Me: You should really make this split pea soup and then put crispy hotdogs on top. Also, let's call the hotdog pieces "meat croutons" - what do ya say?? You [making the same face my husband made that one time I was high as a kite on a combo of industrial strength French cold meds and French wine, trying desperately to explain that I’d just seen deceased artist Jean-Michel Basquiat in the bathroom of our flat during a midnight wee]: Woman, what the hell are you talking about?? Me: Trust me, it's sooooo good! Anyway, Chrissy Teigen told me to do it, so ask her about it if you doubt me. You [still with the face]: Wait...what?? Lucky for me, my computer screen is shielding me from your perplexed expression. Because - perplexity be damned! - my vote is for you to make this split pea soup and then serve it with a thin-sliced and dry-sauteed hotdog or two piled messily on top. It's also true that I first got the idea Chrissy Teigen's Cravings while deeply ensconced in a Cravings bender last year, though, duh, it's nothing new. As usual, I was late to the party and had never even so much as tasted a bite of split pea soup when I came across hers. I also hadn't eaten a hotdog in over two decades, after an unfortunate elementary school birthday party experience (don't ask) had traumatized me into a lifetime commitment of hotdog hatership. Shockingly, one expertly chargrilled (all beef, nitrate free) hotdog smothered in silky carmelized onions and sharp Dijon mustard from the Let’s Be Frank stand around the corner was all it took to cure my hotdog hatred. The soup, on the other hand, took me much longer to fall in love with. That is to say, this is not the split pea soup recipe from Cravings. This is the fun-loving big sister to the Teigen version - more complex and luxurious, though still not too serious to be complimented by a crispy hotdog topping. You see, while I loved the high-low concept of the meat croutons (don't fight it), I could never commit to adding them in along with the aromatics that make up the base layer of flavor, as that recipe called for. I always left them out, which left my soup understandably bland. Then there was the textural element I felt needed attention. Cooked split peas in general are either creamy or not, but what I really wanted was a little of both. And lastly, the bread croutons in the Teigen version (i.e., hot dog buns fried to perfection in butter and served as garnish with the meaty ones) took it to a calorically impractical, albeit very tasty, level for the mid-week dinners when I'm craving wholesome, easy comfort food the most. 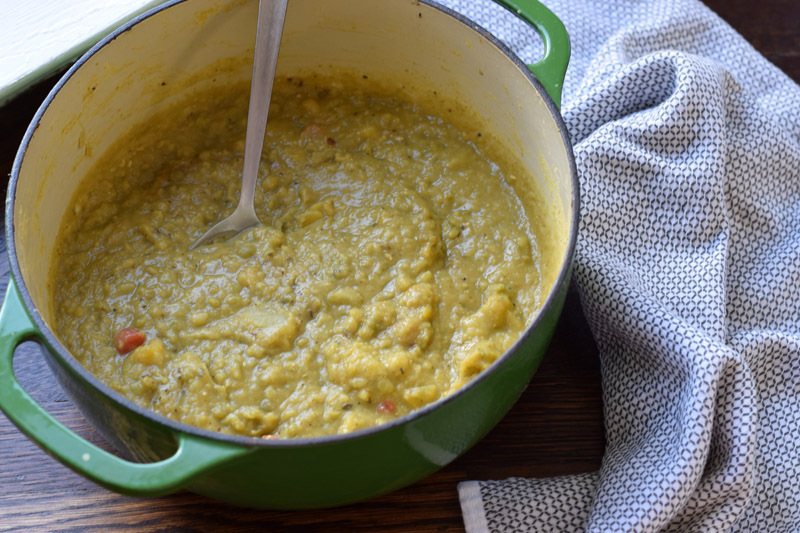 After months of unsatisfying tests and tweaks, I came to my senses and did a google for an entirely new split pea soup recipe only to find that Ina Garten had been doing the damn thing - and doing it well - this whole time. Of course she had! She's Ina Freakin Garten - the woman who discovered a perfectly manicured garden randomly one day in the backyard of her primary residence and then threw a televised lunch party* there to celebrate the discovery. Even her green slop soup is elevated – and Geoffrey just adores it too, I’m sure. By the time I found the Ina recipe I had acquired some serious feelings about split pea soup, so that even Ina's version required some tweaking on my part. And this recipe right here? It is for the split pea soup of my dreams. It's creamy, but with a little bite that’s achieved by adding some split peas halfway through cook time so that they don't soften all the way. It’s rich and hearty but also healthful, and even vegetarian if you use veg broth and omit the meat croutons. (Speaking of vegetarian, hieeee to all my veg friends! If you’re still reading this I’m sorry for saying meat croutons so many times plz don’t h8 me for saying it one more time). Long story long, if you've been on the hunt for a split pea soup to satisfy your weird and comfort-craving soul, here she is all dressed up in her best meat croutons and ready to please. *UGH, I can't find this clip anywhere on the internet, and seeing that I'm at an airport staring at an overpriced plate of dinner that I need to woof down before my flight in 20 mins (because I wasted the majority of my layover searching for that stupid episode of Barefoot Contessa online) I'm throwing in the towel for now. Trust, it was ridic. Serves, like, a lot. 8-10 portions for us, maybe less for others. 7 cups stock (chicken or vegetable) or water with an extra pinch of salt; plus potentially an additional cup for a total of 8 depending on how much yours cooks down and how creamy vs. soupy you like it, we landed just shy of 7.5 cups. Set a 4-quart Dutch oven or stockpot over medium heat, add the oil and allow it to heat up for just a minute. Add the onions, garlic, oregano, salt, and pepper and sauté until the onions are translucent, 10 to 15 minutes. Add the carrots, celery, potatoes, 2.5 cups or split peas, and stock. Give it a good stir and raise the heat to that you bring to a boil. Once it boils turn the heat down, then simmer uncovered for 40 minutes. Skim off the foam occasionally while cooking but don’t worry about removing it all. After 40 minutes, add the remaining split peas and continue to simmer for another 40 minutes, or until all the split peas are soft enough to enjoy - some will be as soft as the potatoes, others will have slightly more bite but, pleasantly so. Stir frequently to keep the solids from burning on the bottom, and add more water, a splash at a time, until the soup is the consistency you like best. When the soup is ready to serve, grab about a hotdog per serving and slice them thinly. Sauté in a dry skillet until they are nicely browned and crispy. Top each bowl of soup with meat croutons and dig in. Reheating note: If you’ve made this in a Dutch oven as (and possibly even more so if your pot isn’t heavy-bottomed) burning on the bottom of the pan is *twice* as likely to occur on the reheat. Perhaps it's because the sun is setting a little earlier each day, or maybe I'm just getting old, but staying in on Saturday is pretty much my jam lately. Now I'm not saying I would turn you down for a drink at the Page, but I'm really only good for one or two. Then it's straight home for sweatpants and couch time. Staying in on Saturday is the perfect anecdote to a week of over-scheduled days and makes the hermit in me want to dance around the apartment to the Pointer Sisters in a snuggie, but still manages to miss one important detail for a stress-free weekend: dinner. Of course there's always takeout, maybe some leftovers, or if you're really lucky, as I was this past week, your across-the-hall neighbors will invite you over for a big bowl of chili and hang time with their impossibly adorable new puppy (squee! ), both of which will have your heart feeling like it's wearing an old favorite cozy sweater inside your chest. But what about those nights in where you find yourself wanting be the Nice Neighbor - though you're already a couple of negronis in and you wouldn't change out of your sweatpants to save your soul - as I did last weekend? Well for those nights we have the easiest, breeziest, most beautiful cover girl version of Julia Turshen’s Nice Lasagna. A Lasagna that turns almost no effort into eat-the-whole-pan-in-one-sitting results. A lasagna with tricks up its sleeve. It starts off rather questionably. Assembly is a messy, gloopy affair of slapping together parboiled dried lasagna noodles (or uncooked fresh, as the original suggests), two cheeses, a couple handfuls of ripped up basil, and a soupy sauce that contains a somewhat offputting secret ingredient, crème fraîche. I’ll admit, the first time I made this, I shoved it in the oven and spent the next 35 minutes worrying that we were going to be eating chips and salsa for dinner due to a botched lasagna job. But what I pulled out of the oven had me making the heart-eyes emoji face - an utterly babelicious pan of pasta, with a perfectly bronzed lid (as SK says), and miles of crunchy edges. And once we dug in - have mercy it was over. Over, I tell you! It is so positively grand though not the slightest bit pretentious, and most importantly, free from the unpleasant greasiness so commonplace in restaurant-made lasagnas. For that win (or, #SmallVictory) I credit the crème fraîche, which you actually can't taste once cooked. You only know that something spectacular is going down and you're thrilled to be a part of it, while wearing your sweatpants, negroni in hand. Happy weekend! *Noodles: The original calls for you to make your own pasta, and while I'm sure it Seventh Wonder of the World-level delicious when you do, I am going all in here for using parboiled pasta. It's just ridiculously easy and tastes so, so good with far less effort. It's cray. Of course I will report back when I make it with fresh pasta (which I plan to, eventually) but for now, I'm Team Parboiled all the way. As for the brand, I used De Cecco every time because that's what my local grocer carries, but I have used Barilla successfully many times in the past. In a large saucepan over medium-high heat, warm up the up the olive oil, add the garlic and a little pinch of red pepper flakes. Cook until the garlic begins to turn golden, about 2 minutes. Add the crushed tomatoes and diced tomatoes along with 1 teaspoon of salt, and bring to a boil. Lower the heat to medium and let the sauce simmer for about 20 minutes. Turn the heat off, adjust the sauce for seasoning (I add a little sugar if the tomatoes taste especially acidic) and allow to cool slightly. Add the crème fraîche and stir until well combined. Spread a thin layer of sauce onto the bottom of a 9-by-13-in (23-by-33-cm) baking dish, making sure that the whole surface is covered. Add a layer of pasta (typically 4 sheets per layer) overlapping slightly. Spoon over just enough tomato sauce to cover the pasta and then scatter over some mozzarella, parmesan, and basil. Repeat with the layers until you've used up all of your components, ending with sauce and cheese and no exposed basil as it will burn. (Note: I found that even with a light hand the cheese will go first, which is why I mention needing a little extra for the top layer). Bake the lasagna, uncovered, until it's got a nicely bronzed crust on the top, the edges are bubbling, and the corners are crispy, about 35 minutes. Let it rest at room temperature, just like you would a steak (says Turshen, I almost never make steak - gasp!). Let the pasta fully absorb all of the sauce before serving so that you don't end up with any soggy slices. Slice into squares and watch it vanish before your eyes. August 31st made it one year of me living in San Francisco, and I am falling harder for this city with each passing day. I can't get enough of the hills, the people, the proximity to the Pacific Ocean, and the architecture (bay window swooning like 24/7). I've even grown to appreciate that three quarters of the city shuts down and goes to bed at 10pm even on weekends, and I can't help but laugh when I walk through a cloud of weed smoke on my morning commute. But if there was one leeeettle thing I could complain about (c’mon you knew there would be) it's that this City is so damn CHILLY! Guys, August was the coldest month of the year so far! What the what?! As a native of one of the sweatiest regions in the country, I'm perplexed. Well, my mind is perplexed. My stomach, on the other hand, has adapted just fine, by starting to crave soup two full months ago. Soup! In August! Of course I wasn't having it. I busied myself instead with noodles and allowed one tiny exception of a soup that was just adventurous enough to be a thing unto itself. What I'm saying is, I've been waiting for this moment for two full months. So let's not waste another minute getting to it. It's officially soup season in the northern hemisphere!! And this soup is such a worthy season opener. Chocked full of carrot coins, diced peppers, white beans, sausage, and leafy greens it makes a perfectly fine meal on it's own. But I won't pretend that a grilled cheese on the side doesn't take it to full soup nirvana, because you know good and well it does. Spicy is in the name, and if you follow the directions as written that won't be a lie. It's definitely got some kicky heat to it; that subtle back of the throat heat which I love and crave. If you're not so much into the heat or don't have the stomach for it (I feel you), use a mild or sweet Italian sausage and hold back on the red pepper flakes. We threw a Parmesan rind into the pot while it cooked and it added an unbeatable creamy finish, so use it if you've got it. This recipe makes quite a bit so you might want to freeze half you are only feeding two people. I was planning to freeze some myself, but we ended up finishing the pot for dinner last night. The soup waiting game is over to say the least. Place a large Dutch oven or stockpot on the stove over medium. Add the sausage, and cook, breaking it up with a wooden spoon until well browned with some crispy bits, about 10 minutes. Transfer sausage to a paper towel-lined plate. Add the onion, peppers, carrots, and tablespoon or oil if needed for the vegetables to not stick (I needed it). Allow the vegetables to cook, stirring frequently, until onions are tender and have sweated enough to release the brown bits stuck to the bottom of the pan, about 8 minutes. Add the garlic, rosemary, salt, black pepper, and red pepper flakes (if using) and cook for about 2 minutes more. Stir in chicken stock, tomatoes and their juices, reserved sausage, and Parmesan rind if using. Bring soup to a boil, then reduce heat, cover with a lid, and simmer on low for 20 minutes. Remove the lid and empty the can of drained and rinsed beans into the pot. Using a blender (though this would also work with a potato masher) blend half of the un-rinsed can of beans along with most of the liquid from the can. Add the purée along with whatever beans and juices are left in the can to the pot. Rip the chard or kale into bite sized pieces, toss them in, and give everything a good stir. Simmer for at least 10 minutes more (though after that you can pretty much let it hang out in the pot with the burner off until you're ready and I left mine for a good 30). Remove the Parmesan rind before serving. Ladle soup into bowls, garnish with cheese if you wish (though we didn't need it), and swan dive in!